What is life like working for New Media Guru? Expert and experienced teams with the focus to build great products and services. Quality unsurpassed by any other provider on the market. Employees encouraged to take initiative, empowered to make decisions, and ambitious enough to face new challenges. Transparent and clear processes that involve the client 100% of the way through the project lifecycle. Our clients require quality work that will increase their profitability and return on their investment in the projects they hire us to complete. We have benefits that rival other outsourcing partners and offer our employees training making them more valuable to our clients and us. "My experience with NMG has been extremely enriching. NMG’s open environment offers numerous learning opportunities. 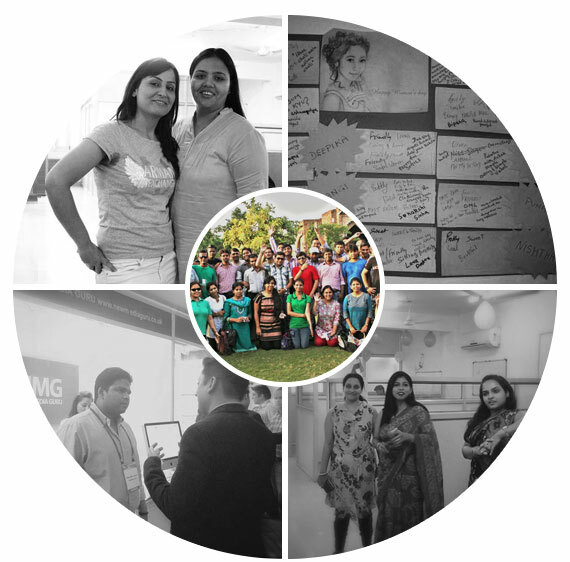 An approachable management, dynamic work environment and versatile people make NMG a great place to work. I have thoroughly enjoyed working with NMG and I look forward to having a long-term relationship with the organization. I wish NMG to grow further and achieve newer heights. " "I have been working with NMG for over 3 years now and it has been a much rewarding and an exciting experience. Its open & friendly environment has helped me grow as a professional. It feels terrific to be a part of NMG." "I am very proud to be an NMG employee because it is like a family where “TRUST” is our greatest Asset. Working at NMG, gives you freedom to experiment and innovate, and provides friendly work culture. It’s the best company I have ever worked with. In NMG everyday people get new opportunities to gain experience and grow. Hard work and dedication never go unnoticed here, and these directly translate to career growth and rewards. Supportive seniors make challenging tasks also fun and exciting. To describe my experience here in one word, it has been 'Enriching'." "It’s my pleasure to be part of NMG. I feel that NMG is a platform where you can grow and utilize your skills in healthy environment. My team here has supported me lot and as a result I always fulfill the client expectations and much more. Management of NMG is excellent, supportive and flexible. I wish NMG achieve all success in future." "Prior to joining NMG, I have worked with couple of other organizations but I have never experienced anything even closer to what NMG is. I love the way people support specially the seniors. Offering such a challenging and supportive work environment, which provides job satisfaction, prompts decision-making and encourages delivering exceptional levels of performance with so much transparency makes NMG distinctive from the rest. It will be difficult to share names of all people who have been there throughout for me however; I would like to thank all of them personally." "I started my journey with NMG in November 2012. It has been a great experience with the required freedom to reach at the highest level of productivity. Every employee is managed by experienced and specialized Team Leads and Project Managers. The work environment keeps me happy. It’s like a complete package an employer can give to its employees. Every day is a new experience, new learning and growth. " "I have been working in NMG for the last 2 years as software developer and it has proved to be an amazing experience for me. New Media Guru is a nice place to work as I have always been given the opportunity to learn and work on challenging projects; supervisors are always ready to provide their support. This helps me to explore my potentials and improve my skills. I feel fortunate to be a part of NMG. " "NMG is an organization for its employees and by its employees. The best part of being part of this company is that it not only offers opportunities for those who have talent and wish to grow professionally, but also facilitates such efforts. I have been with the company since 2011 and the journey so far has given me exposure to all facets of my area of expertise, confidence to explore higher levels of achievement and the ability to accomplish professional excellence. I’m proud of being part of the NMG family. If you are self-driven, self-motivated, are looking for a challenge and want to expand your knowledge in SEO industry; then New Media Guru is the right place for you." "Clarity of goals with freedom to drive results using innovative ways & ideas makes NMG a challenging & fun place to work with. The trust the management has in each of its employees, shows the highest level of confidence which helps an individual to grow. Each day at NMG is a day of learning which keeps me involved in learning & overcoming new challenges. " Interest Free Loans: We believe in “a friend in need is a friend indeed.” We offer interest free loans to employees at times of need. Mentor/Buddy System: We team you up with your buddy who helps you get to know NMG more closely while your mentor plans for your successful future. Employee Assistance: We make your life easier by assisting you with legal, taxes, banking and other activities, so that you stay focused on client commitments. Flexible Work Hours: NMG provides option to employees to opt for flextime based on the demand of the work. Work From Home: We provide the flexibility to work from the comfort of your home. Infrastructure Allowance: For those who want to be connected, we offer mobile and internet allowance in addition to laptops and mobile devices. Paternity leave: To enjoy the new happiness of their life we offer paternity leaves to the new dad’s. Appreciation day off: We offer a day off for employees putting in extra efforts & pain in completing the tasks assigned to them. Birthday leave: To enjoy their special day with family & friends we offer a half day leave to all employees on their birthdays. Marriage leaves & gift: NMG sponsors a marriage gift for you & your spouse, and also to enjoy your special occasion NMG gives you marriage leaves. Marriage anniversary leave: To enjoy their special day with their spouse we give half day leave to all employees on their marriage anniversaries. Work Environment/Culture Groups: We have special interest groups in the company to encourage improved work environment and culture. We also provide you with the opportunity to lead group meetings. PARWAH group: We have an in house counseling group “Parwah” which works towards lending an ear to life issues of employees & provides solutions to them. Travel reimbursement: Employees who stay back late after working hours are given travel reimbursement. Late stay back: If an employee stays at work late in the evening they will be given an option to arrive at the office later than the allowed reporting time, the following day. Certificate reimbursement policy: If you are working towards professional certifications, NMG encourages you to complete them by reimbursing your fees. Are you ready to challenge yourself by entering the fast paced world of outsourcing?